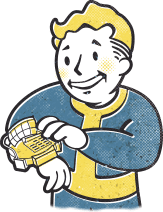 Can you verbalize all the amazing things you love about Fallout®? The first words that come to my mind are Visually Stunning. The intricate detail and thought behind each program on an old movie counter or graffitied poster on the wall when you walk down the street has been added to fully immerse the player into the reality of Fallout®. Together with Bethesda Softworks and GameStop, Chronicle Collectibles wants to explore creating full statues out of the fantastic two-dimensional artwork from within the Fallout® universe, starting with one billboard in Fallout 4®: a pin-up style picture of the Vault Girl. The Fallout® Vault Girl Statue for the Modern Icons Series is a limited edition 9” statue featuring Vault Girl holding the Super Sledge ready to take out the Enclave. Whether you need that encouraging smile by your coffee in the morning or you have a constant desire to emphatically produce a “thumbs up” to anyone who walks by, this Vault Girl Statue is just for you. Don’t delay; this limited-edition statue won’t last as long as the Vault Girl Billboard you pass every day.